One thing I hope I've shown throughout the course of this blog's history is how enjoyable it can be to build a collection on the cheap. 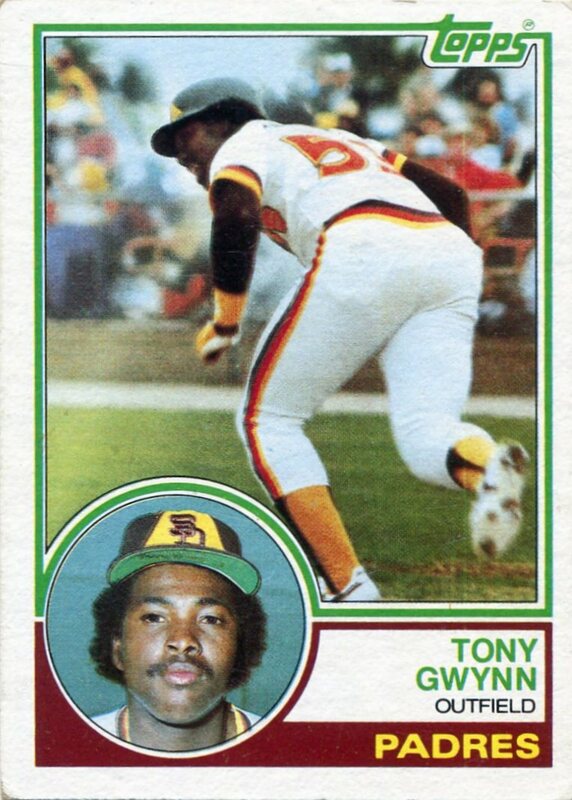 I specifically like to player collect because it's fun and not really all that difficult, and perhaps there's no better example of this than my relatively recent quest to hoard cards of the late Tony Gwynn. When I decided to start collecting him a couple years ago, I owned maybe 50 of Gwynn's cards. Now, at last count, my collection spans a whopping 307 different singles, about 95 percent of which were accumulated via dime boxes with little to no effort on my part. While there's still thousands of Gwynn's cards left to chase, I think my collection of Mr. Padre is now more than big enough to warrant a legitimate Top Five post dedicated to his honor. 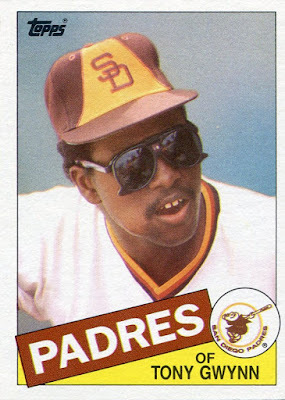 Have there ever been sweeter shades on a baseball card? I hope to be a teacher one day, and this is the only card I've ever seen that combines my hobby and my future career aspirations. Something about Tony Gwynn's affable demeanor tells me that he would've been a fine professor had he not put together a Hall of Fame baseball career. My binders are filled with strange baseball cards, but this is one of the strangest. I can't imagine what people thought when they pulled this card from packs. 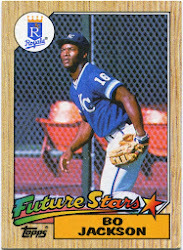 Who is this Sanders fellow and why is he on a Tony Gwynn card? 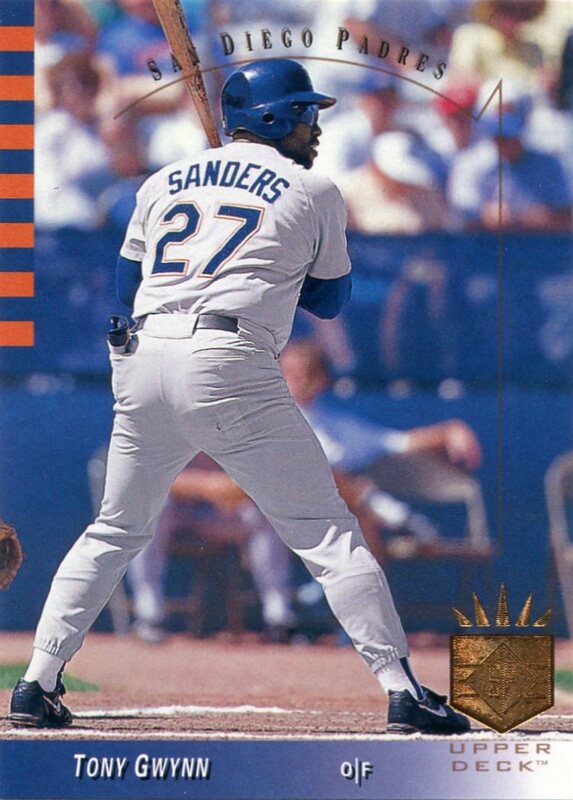 Turns out the Sanders in question is former Padre pitcher Scott Sanders, and Gwynn donned his jersey for a single Spring Training at-bat because he'd apparently forgotten his own famous #19 back at the team's hotel that afternoon. Isn't it great when innocent oopsie moments wind up on our beloved baseball cards? I love specific cards for many reasons. 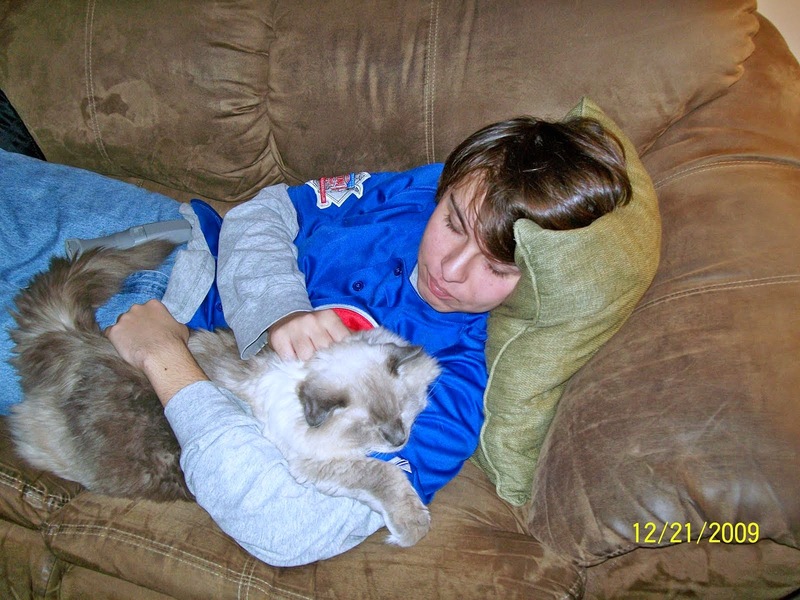 Some hold fond memories. Some feature splendid action shots. Some document historic moments. And then there are the cards I love for reasons that aren't clear to me. 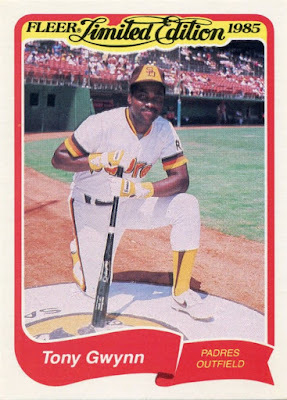 This one does indeed feature my all-time favorite Donruss design, but other than that, it's not much besides a standard close-up photo of a young Mr. Padre. But despite its simplicity, there's just something about this card that has always captivated me, a special something I can't quite put into words. It took almost two years of searching at card shows to finally find an affordable Tony Gwynn Topps rookie. This is one of the classic images of the '80s (despite the unfamiliarity of Gwynn wearing #53) and will most likely always be my favorite card of Mr. Padre. Fleer and Donruss also issued Gwynn rookies in '83 (neither of which I own...yet), but the Topps one has always reigned supreme in the hobby, in no small part due to the fact that it happened to appear on one of the most memorable designs in Topps history. 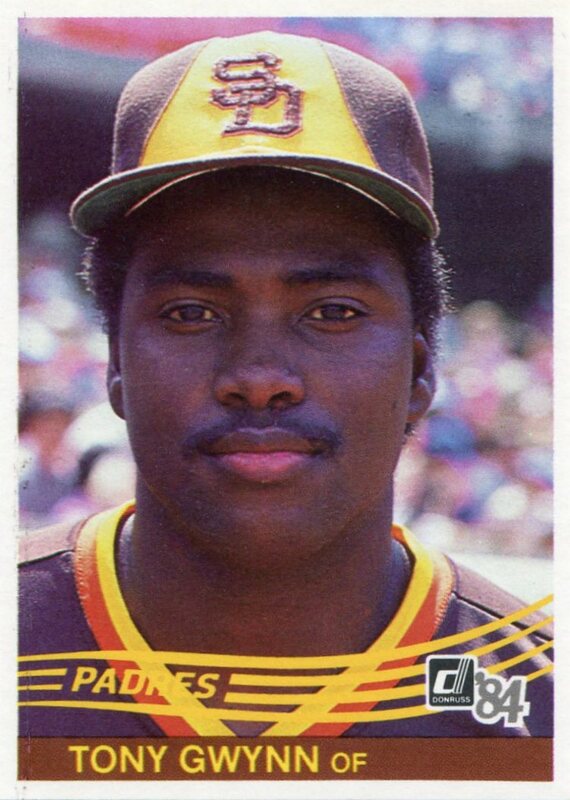 I often wonder what other Tony Gwynn gems are waiting for me in the dime boxes of the future, but for now, I couldn't be happier with how easy it's been to collect a massive talent like Mr. Padre. Great list, can't disagree with any of your choices particularly your top 2. 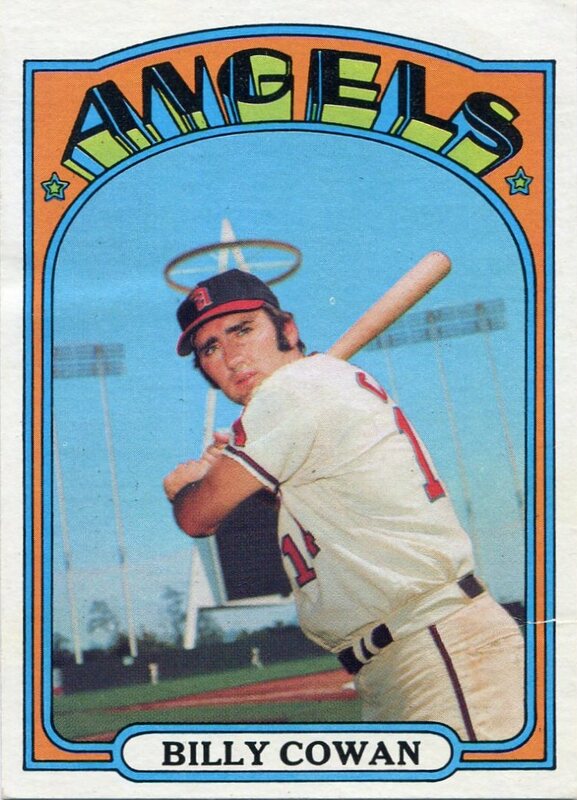 Even the lead-off card you selected prior to the top 5 is just awesome. Loving these posts! No arguments here. Great variety. Never seen the strange SP. 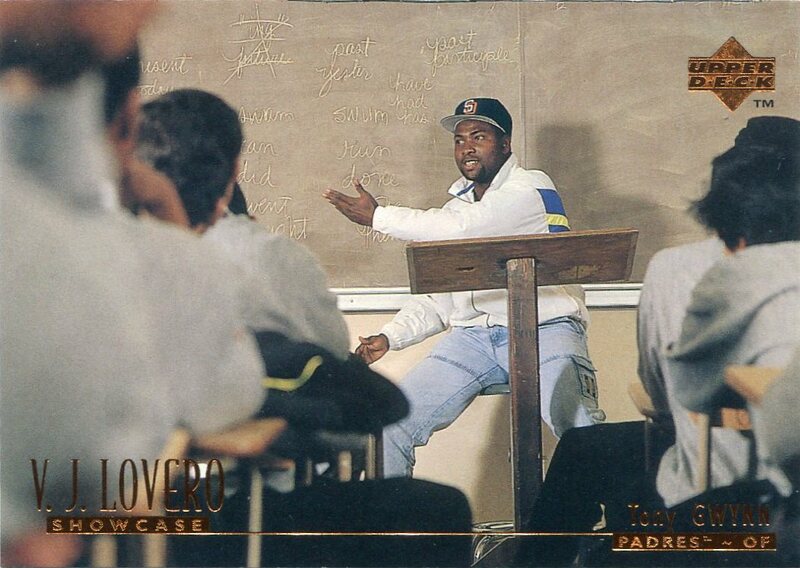 Tony Gwynn is my guy! I'm in the slow process of sorting my PC to try to figure out how many cards I have of him. 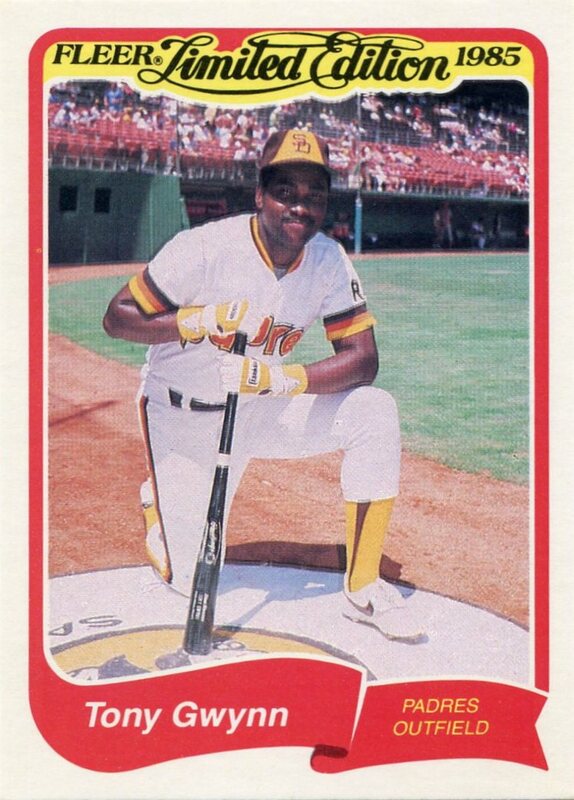 Love those early 80s Padres uniforms! Not sure if Tony was every technically a professor, but he did coach San Diego State University's baseball team, if that counts. It's sad how many of his cards feature him with a wad of chew in his cheek - makes the sting of his passing that much worse. What's in a card show?